What makes our Fleet so special? 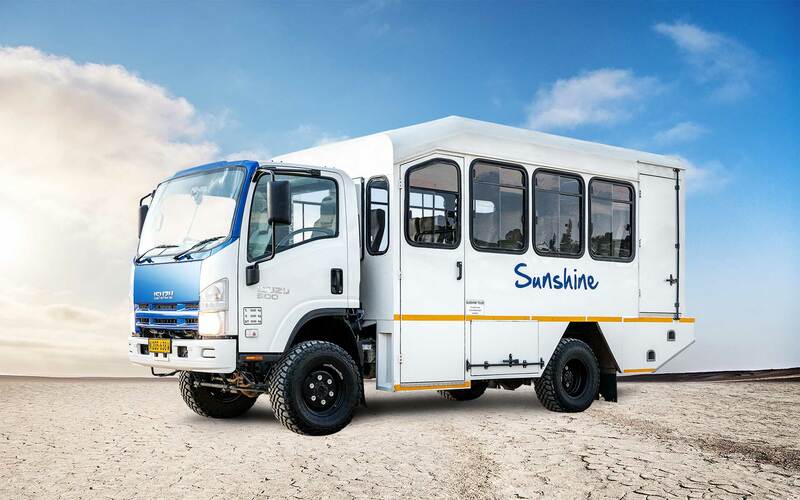 All our vehicles are Namibian registered and have the necessary permits and documentation required. 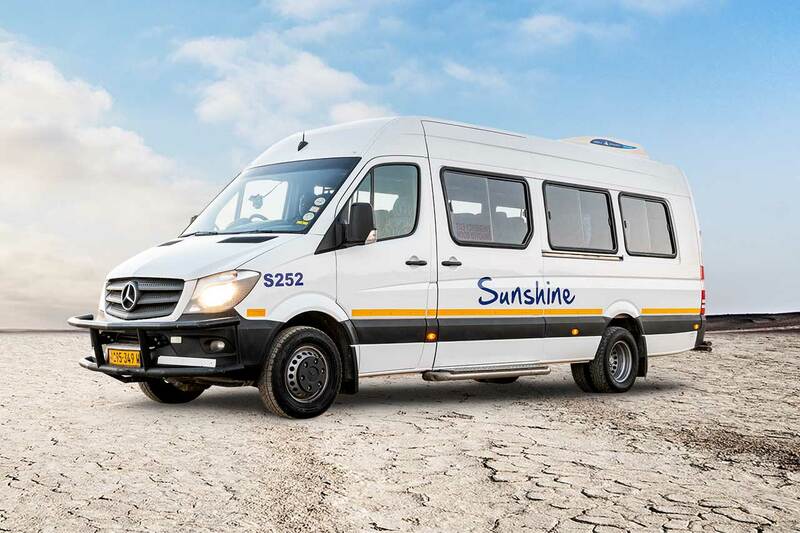 Our vehicles comply with all Namibian Legislation, including the Namibian Road Transportation Act. 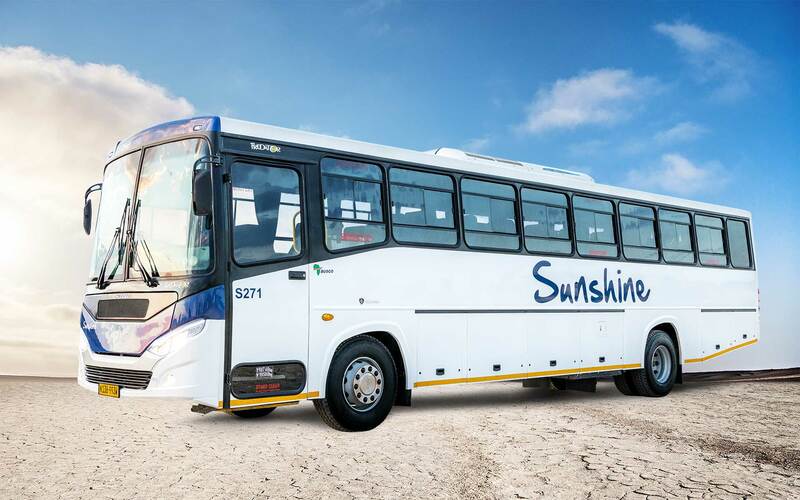 Every coach from the smallest to the largest is fitted with its own fire extinguisher and medical aid kit. This is serviced and stocked on a regular basis. The safety of our passengers is our NUMBER ONE priority. 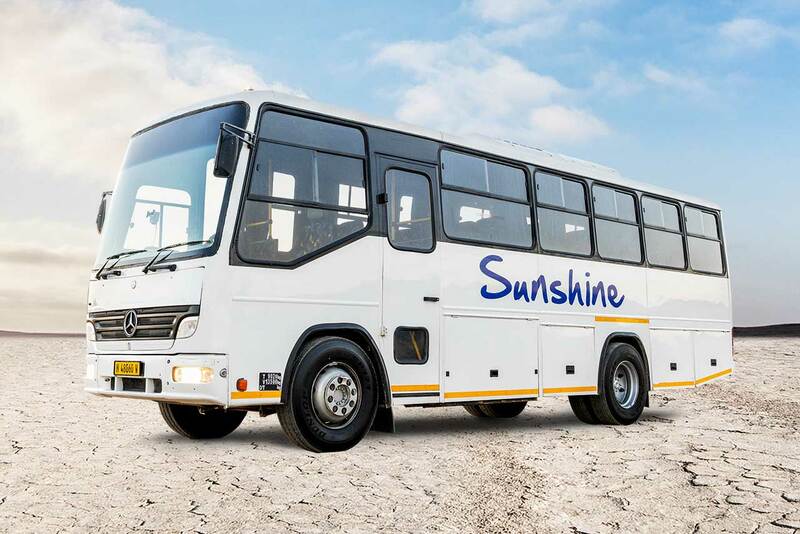 Since the establishment of SUNSHINE TOURS over 15 000 000km has been travelled without any fatal accidents. All our drivers can and will be trained to the specification of our clients. 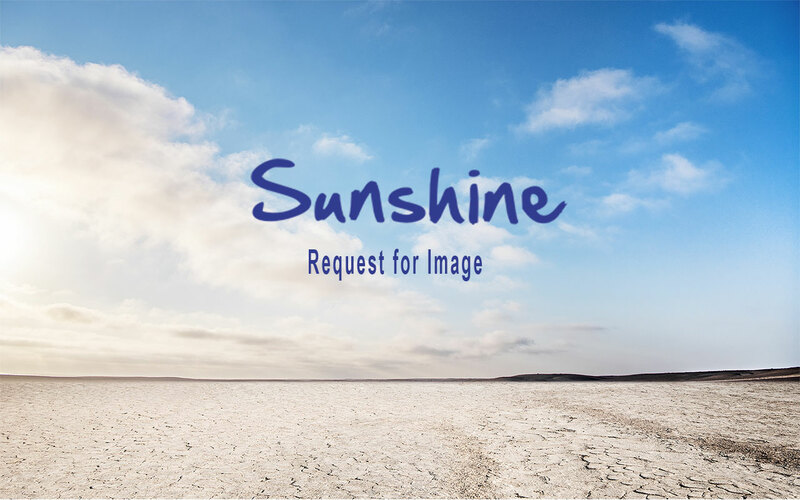 What distinguish Sunshine Tours from its competition is the safe, professional and efficient services we offer. 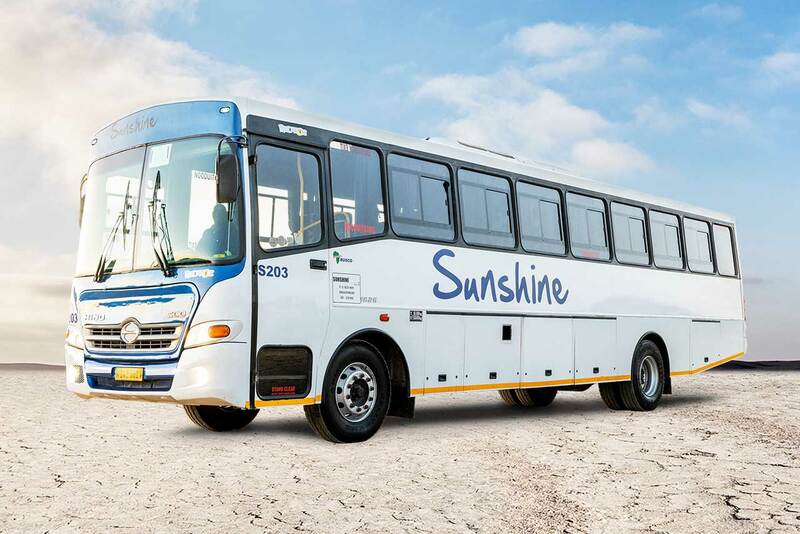 The safety of our passenger is our number one priority and the fleet is constantly maintained and monitored. Our maintenance crew are on standby 24 hours a day and we also have cleaning staff who works around the clock to keep our busses spotless. Our clients’ satisfaction is extremely important to us; this is why we go above and beyond in order to ensure that our clients receive the best service possible. If and when we receive any complaints, no matter how small, we attend to it immediately in order to resolve any problems and to make sure it does not happen again. Our service is based on our motto: ‘Ductus Exemplo’. We believe our service is of such a nature that others would want to follow it. We are committed to providing the best service. Hard work, diligence and commitment are the keys to our success. We provide first class luxury, convenience and comfort; and our professional workforce ensures that our customers receive the best service possible. 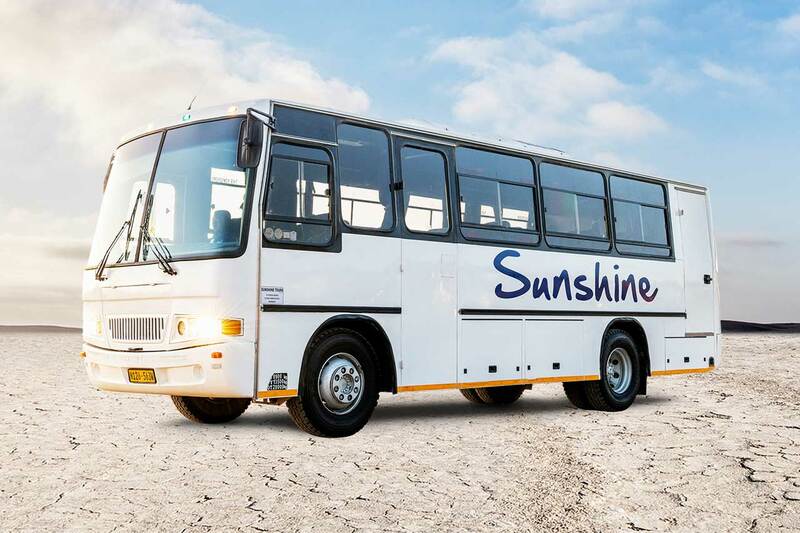 Punctuality is guaranteed when making use of Sunshine Tours. We are renowned for our on-time service delivery. Various systems are in place guarantee all busses/vehicles leave the specific depot on time for each trip. One of these precautions is that all drivers have to report for duty forty (40) minutes before their departure time. This ensures that drivers have ample time to do all pre-departure checks well in advance. Our prompt and punctual service ensures that you reach your destination on time, every time. Confidentiality is non-negotiable. We pride ourselves on keeping the operations, business and affairs of our clients confidential. We have various measurements in place which ensures that any information relating to our clients remains confidential and only authorized information is conveyed to our employees (only related to their work) and any other third parties. In addition to all other measurements implemented, all our employees sign a confidentiality agreement.